For some, interviewing comes easy. For others, it is absolutely petrifying. Understandably so. Let’s face it, you are meeting with people whom you have never met, asking you questions you don’t really know the answer to, for a job you could do with your hands tied behind your back. 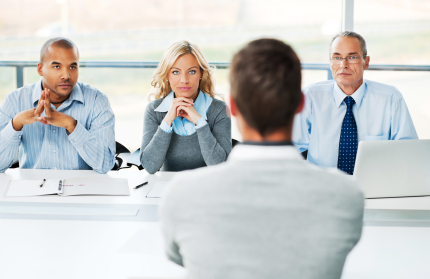 In fact, according to Everest college, “92% of people have nervousness over some part of the interview process.” Don’t be afraid, in a lot of cases, the interviewer is just as nervous as you. So what are the secrets? I have been admired in this department as I have found much success. The people at the other end of the table are there to hear about you, your accomplishments, and how well you think you could perform in this role. After all, they chose you to come IN PERSON. In today’s world of pre screening, Gallup tests, and phone interviews, that’s a big deal. It’s okay to toot your own horn a little bit. Don’t lack confidence, that will let employers know that you may not perform well under pressure, and you will lack confidence in your abilities. Tell them who you are with power, and show them you are the absolute only candidate for this job. Trust me, it works. For god sakes, remember the interviewers name. If you have to write it down, DO IT! You should shake their hand when you walk in that room, have a real presence in their office, and thank them using their name when you leave that room. Always remember to keep eye contact. I promise you, if you don’t use their name at least once, odds are they won’t remember yours. Those people on the other end of the table shouldn’t be the only ones with questions. Make sure you are prepared to ask questions. “What is the company culture like?” “What are the metrics you use to measure my success?” “Does the team typically eat lunch together?” I know, it seems comical, but it will really mean a lot to the interviewers. It proves to them that you want to make an effort to be apart of the team. These are just a few key questions I recommend you ask. In addition to asking questions, take notes. Write down key points that your future employer is saying to you. It will relay to the manager that you are engaged, and eager to learn about the role. Everyone hates those pesky behavioral questions. “Name a difficult time you had with a co worker?” Seriously? Do you really want a future employee to answer this with an actual scenario? I wouldn’t. Most of us, if you are like me, work to get along with everyone. If you have never had a bad experience, tell them that. Let them know that you’ve never had that experience because you work to keep a good working relationship with all your co workers. If you have had a bad experience, be honest. Explain it, and tell them how you worked to resolve the situation. Employers will respect that. Do your best to answer these, and if you can’t think of anything, think of a possible scenario that could happen in your current role. Trust me, it works. Don’t be nervous, we’ve all been there, and odds are we will be there again. Go in with a positive attitude, be ready to ask great questions, know yourself, and get that job.